10,500 BCE Era - The Celestial Blueprint | Edgar Cayce's A.R.E. In his trance state when Edgar Cayce was asked when the Great Pyramid of Egypt was built, he stated that its construction was from 10,490 to 10,390 BCE (reading 5748-6). I have written earlier about the stars in the sky during this ancient time frame (see blog article “The Stars Above, the Great Pyramid Below: 10,400 BCE, 12/16/11), but there is more… much more. The previous article had noted that the stellar asterism that we today call “the summer triangle” were circumpolar stars at this ancient time. This pyramid of stars could have been their north guide. The ancient Egyptians saw these as the “imperishable” stars, the stars that never set as they never fell below the horizon. According to Egyptian mythology, this is the place in the sky where the Ba (the personality) and the Ka (the life force) soul parts would, once united, go to dwell as immortal brilliant spirits called akhus or khus. This time period around 10,500 BCE has drawn the attention of such researchers and writers as Adrian Gilbert, Robert Bauval, and Graham Hancock, all of whom have written about aspects of this celestial landscape and how it fits this olden time period. Their research suggests an alignment of the pyramids of the Giza plateau with the constellation Orion/Osiris. It also indicates that during this time the constellation Leo rose due east out of the horizon to meet and greet its counterpart on earth in the sphinx, which faces due east. Dr. Robert Schoch, a geologist and a geophysicist, has examined the Sphinx and writes that the Sphinx and its surrounding area date to at least 5,000 to 7,000 BCE, if not earlier. This is at least 2,500 years earlier than the date given to it by Egyptologists. Dr. Schoch has also written about evidence that an advanced lost civilization from this 10,500 BCE time period may have been destroyed, possibly from solar cataclysmic events. I have discovered even more evidence that makes the celestial sphere at this 10,500 BCE period even more ideal and unique for the construction of the Great Pyramid and a Golden Age of ancient Egypt called Zep Tepi (the First Time). The northern triangle of stars has already been noted, but they were not the only significant triangle of stars of that time framing the pyramid. In the far south of the sky was what we call today the Winter Triangle or Great Southern Triangle, another asterism of stars. This triangle consisted of Betelguese (Orion’s shoulder), Procyon, and Siruis. So, at this 10,500 BCE era, there was a far northern triangle and a far southern triangle of stars in the sky that are linked together by the Milky Way, which runs through both. These two triangles of stars were not only connected by the Milky Way, they mirrored each other in the ratios of degrees between the stars in each triangle. It was a ratio of 1-2-3, for both! In simplest terms this means if you put a stick in the ground and sighted along it either due north or due south, then marked the spot on the stick that each of these two stellar triangles individual stars contacted the stick as they rotated past it, the ratio between these marks would be 1-2-3. These events and alignments only happen during this era. For the Egyptians this would have had significance in multiple ways. Pyramids are considered to be symbolic mountains, places where heaven and earth could come together. The Egyptian hieroglyph for mountain is “Djew,” which also represented the two cosmic peaks that supported the sky and were guarded by lion deities. The Djew hieroglyph was closely associated to the hieroglyph “Akhet,” meaning the “horizon.” Here the sun disk was put between the two cosmic peaks and during its east-to-west journey was also guarded by these lion deities. These hieroglyphs certainly seem to be describing the events in the sky. 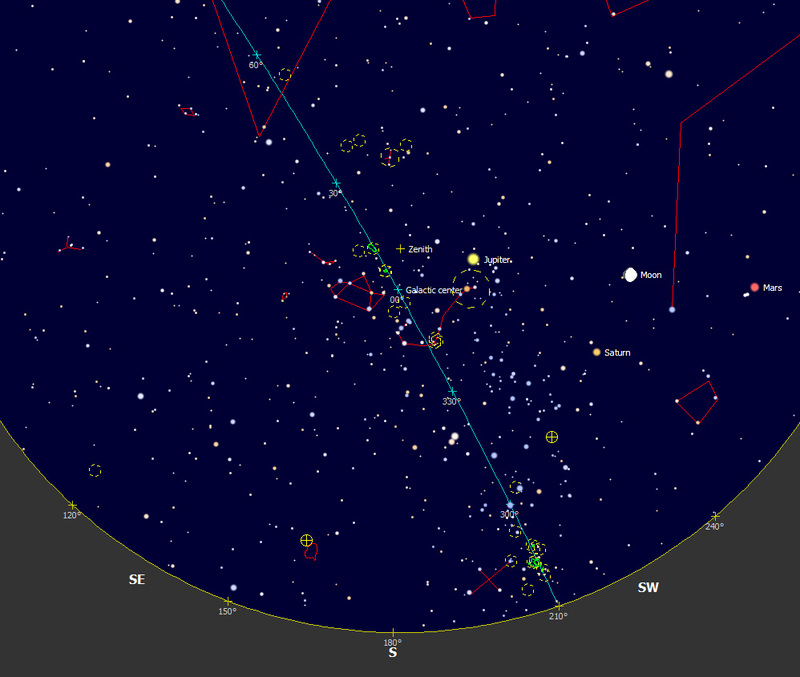 At this distinctive time, there is the constellation of Leo rising due east and traveling west across the sky, as does the sun, and during this same period you have cosmic triangle mountains, north and south, acting as pillars for the sky, connected by the Milky Way. Just as it is described by the hieroglyphs. These connected triangles are also an excellent representation of the pre-dynastic Egyptian serpent god, Nehebkau, who was sometimes represented as a snake with a head at each end. 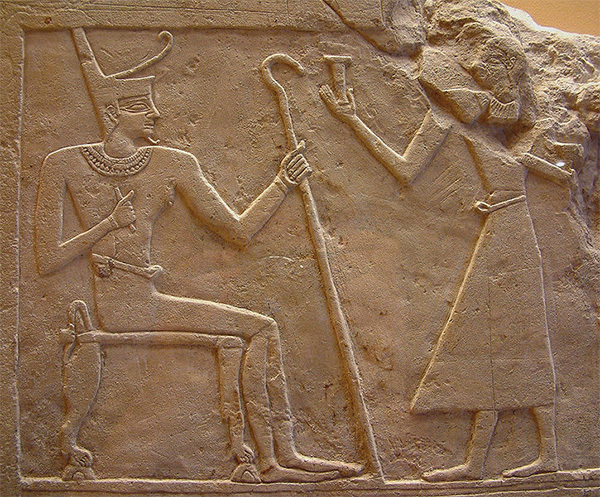 He linked together the kas and the bas, mentioned earlier, of the Egyptian soul. Nehebkau gave the people their true names and fed them with the milk of light, which was perhaps representative of the Milky Way. There is even more occurring in the sky that completes this cosmic tableau. It involves the zenith of the sky, the zenith being the point directly over one’s head or over an object on earth such as the Great Pyramid. The line that can be drawn from the Great Pyramid into the heavens is a third axis to join the north and south axis of the stellar triangles and the east-west axis of the constellation Leo’s journey. During this ancient period, the galactic center, the thick bulge of the Milky Way, would have been directly overhead. By the zenith and next to this would be the starry asterism called the “Fish Hook,” the tail of the Scorpio constellation. This “fish hook” looks just like the Egyptian “Heqa” staff or shepherds crook of the pharaohs. This staff is also symbolic of the Kundalini forces. This shape is also the same shape of the Hebrew letter “lamed,” the 12th letter of the Hebrew alphabet; considered the center of the alphabet, it is the tallest letter, sometimes called “the heart of knowledge.” Lamed literally translates as ox goad, like a shepherds staff, and is drawn the same way. It later was drawn looking more like an upright cobra, which is fitting as well in its symbolism. Lamed, as a numerical value, is translated as the number thirty. 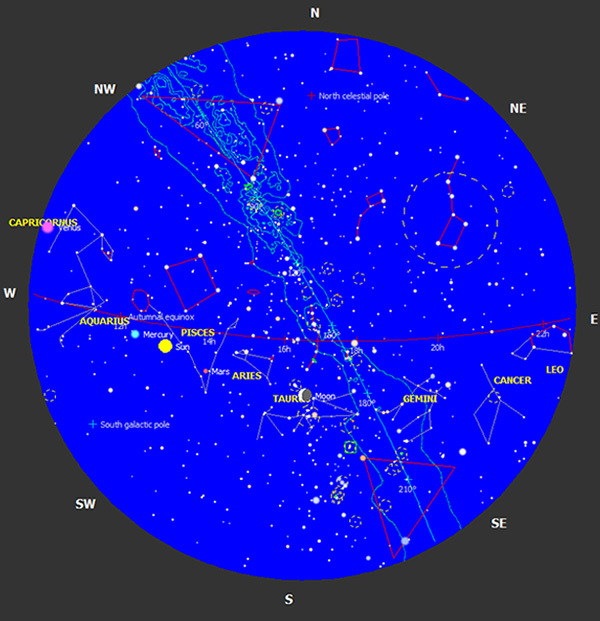 Cybersky5 star map showing sky zenith, galactic center, and "starry fish hook"
Further pursuing this zenith hook linked to the letter Lamed yields astounding results. The fact that the letter lamed also represents the number 30 directly above the Great Pyramid is very significant itself. Researchers have shown that the dimensions incorporated into the Great Pyramid represent 30 seconds of equatorial latitude and 30 seconds of longitude. Further the Great Pyramid is considered by many to be in the center of the land masses and is located at N 30 degree latitude and East 30 degrees longitude (actually 31 degrees E). If you determine the height and width of the Great Pyramid by the unit of measure the Cayce readings state was used in its construction, that of 27.5 inch cubit, your result is 210 cubits for its height and 330 cubits for in width. The ratio of its height over its width gives you a result of 7/11. Keeping in mind the importance of the number 30 discussed here, the height equals 7 x 30 (210) and the width equals 11 x 30 (330). What is created here is an amazing three-dimensional axis; north to south, east to west and up and down. This is an axis mundi depicting center of the earth and galaxy, in this case also a center of knowledge, where heaven and Earth meet. I think in an absolutely stunning design, the dates of construction given in the Cayce readings for the Great Pyramid have given us a time when the sky represents it and a philosophy towards perfection ideally. This is truly a celestial blueprint. Donald B. Carroll spent his career working in Fire & Rescue, as a district chief, academy instructor, and paramedic. During those 30 years, he raised a family and pursued the meaning of life through extended study into the Cayce readings and other spiritual, scientific, and philosophical materials. Today, he is a regular speaker and writer of metaphysical topics from Cayce to the Kundalini. He spent 10 years researching and writing his latest book, Sacred Geometry and Spiritual Symbolism: The Blueprint for Creationwhich unifies spirit and science through geometry and symbolism (available for pre-order at ARECatalog.com). He is also an international tour leader for the nonprofit Association for Research and Enlightenment, visiting sites of a spiritual nature across the globe.